You are here: Home / Sponsored / Holland House Cooking Wines! Have you every tried Holland House Cooking Wines? I really don’t use wine to cook, but after trying these, I may be changing my mind! They were a great addition when we tried them.. Also they are sugar/fructose free which is how Hubby and I are eating now, so that worked out perfectly! We have used both of them in hamburgers, with chicken, and some veggie dishes and are really enjoying the flavor they add to each dish! For Over 100 years, Holland House has been bringing great flavor and taste to millions of American homes. Since 1867, Holland House has been trusted as America’s #1 brand of cooking wine, helping transform ordinary to extraordinary with home cooking. Try something new tonight with Holland House! These wines are great to use in sauces, stews, marinades, and gravies and more! There are great recipes and more info on their website: Holland House Flavors. You can also sign up for FREE to get recipes, tips, and even coupons! Once you sign up for it and confirm your FREE subscription, they will email you a printable $1 off coupon! With a crisp and light white-wine aroma, this selection offers a slightly dry but distinct wine flavor perfect for cooking lighter dishes. FISH: A Natural choice with fish and seafood. CREAM SAUCES: Stir a splash into light cream sauces for rich Holland House flavor. SIMMER MEATS: Simmer with seafood or chicken for a stovetop masterpiece! 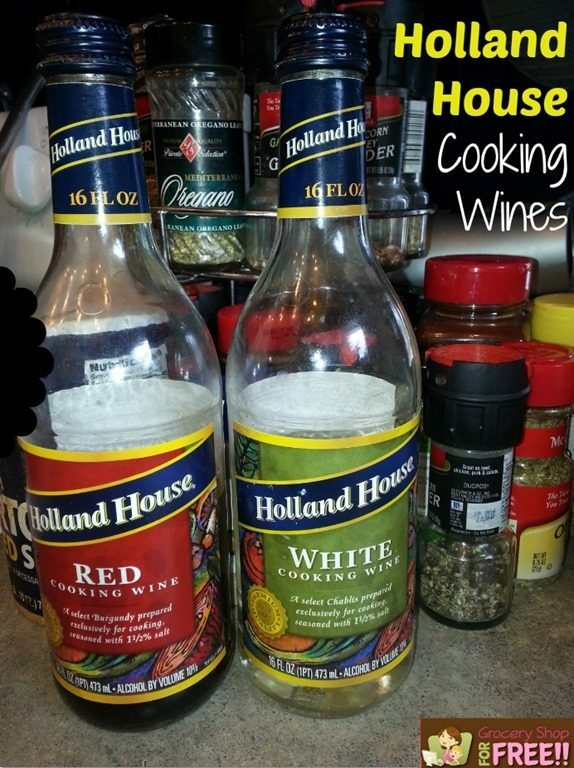 RICE: Replace 1/3 of water with Holland House White cooking wine when boiling rice for great flavor. With a classic, deep red wine aroma and with rich ruby color, this selection offers a smooth, medium-bodied wine flavor that is ideal for cooking hearty dishes. MEATS: Excellent with beef, lamb and pork, especially dark meats. PASTA: Stir into tomato and red-sauces for Holland House marinara flavor. STEWS: Add to hearty stews and soup stock for a savory Holland House taste. MARINADE: Use Holland House to marinate beef cuts overnight for tender, flavor-packed meals. I love using Holland House wines. They are a staple on my stovetop, right next to the olive oil. Ise the Marsala wine to cook the most and I make my Marsala chicken with it. I am really enjoying them they are adding great flavor to the dishes we have used them in! I favorite dinner meal would be baked salmon with vegetables and rice.